“Karlsruhe is very inexpensive, pleasant and friendly”, wrote composer Richard Wagner 1861 in a letter to his wife Minna. A point of view which guests in Karlsruhe still agree to. One the one hand, this may result from the gentle climate: Karlsruhe is one of the warmest cities of Germany and also one of the sunniest. But also the friendliness and cordiality of Karlsruhe’s citizens impress their guests. Karlsruhe’s unique fan-shaped cityscape comes from its founder, Charles III William, Margrave of Baden-Durlach, who erected his palace as centre of the city in the year 1715. From there, roads are leading straight away like light rays. Culturally interested visitors get their money’s worth. There is a rich museum landscape with the Baden State Museum in the palace, the State Art Hall with its impressive collection of modern art or the Museum of Natural Sciences with its fascinating vivarium. A special experience waits in the ZMK (Centre for Art and Media), the German Centre Pompidou: the world’s first interactive museum invites you to join in and marvel. Urban flair and a great natural landscape unite in Karlsruhe. On the one hand the vibrant shopping streets and the biggest indoor shopping centre of Southern Germany offer shopping fun without limits. On the other hand, only some minutes away the green oases of the city habe plenty of space to have a walk or a break. Karlsruhe’s city park with its zoological garden si one of the biggest inner city parks in Germany and the palace garden has great natural areas with gorgeous forests and rare plants. Close to the Rhine river, the region can easily be explored by ship. The passenger ship MS Karlsruhe offers an attractive and recreating experience. For friends of good taste it is worth to explore Karlsruhe in a culinary way. 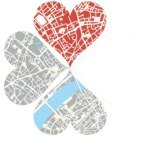 Lots of restaurants, cafés and bars wait for you. Baden’s kitchen is well-known for its home-made specialities with high quality ingredients from local origin. An insider tip is the city district Durlach with a very long history dating back to AD 120 when the Roman Villa Rustica was built at today’s Eastern outskirts. 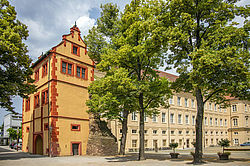 Durlach offers a historic ambience to explorers with its picturesque market square, the palace square and the narrow streets. Culture, nature, pleasure and ambience – there are many reasons to come to Karlsruhe. 1. Karlsruhe as a pattern for Washington, D. C.
Karlsruhe, the fan-shaped city. The legend says that Charles III William, Margrave of Baden-Durlach (1679-1738), was tired during a hunting trip. He rested beneath a tree and when he fell asleep, he dreamt of a fan-shaped city with a superb palace as ist central point. So he decided 1715 to build such a city in the middle of Hardt forest, at this time still a primeval forest. In the centre of the palace an octogonal tower was erected – the geometrical centre point of this symmetrical complex. From this point 32 roads and streets lead away like sunrays. The view from the palace tower over the ray-shaped roads also inspired the later president of the United States of America, Thomas Jefferson, during a visit to Karlsruhe. He drew a sketch of the city shape and sent it to one of the most renowned city planners of his time, Pierre L’Enfant, who took the principles for the ground plot of the Amarican capital Washington, D. C.
A special cultural experience awaits visitors of the ZKM | Zentrum für Kunst und Medien (Centre for Art and Media), the German “Centre Pompidou”: The first interactive museum of the world invites you to join in and marvel. 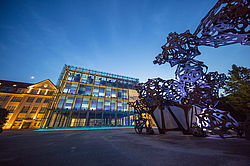 With the media museum, the institute of image media, the institute iof muic and acoustics and the departments of fundamental research and insitute of network development, the ZKM is seen as the world’s biggest culture factory. The unique atmosphere of the huge atriums of the former ammunition factory draws art-interested people from all over the world to Karlsruhe. In the atriums 1 and 2 of ZKM, the Museum of New Art was established 1999. Art works from outstanding private collections can be seen here at over 7,000 square metres. In changing combinations and complements tendencies of European and American art from 1960 to today are presented as showcases. One of the world’s largest media art exhibtions combines media art with painting, sculpture and photography. A direct neighbour is the Municipal Gallery with fantastic art treasures from Hans Thoma to Markus Lüpert. Market Square is the heart of Karlsruhe. Here, the visitor can see the town’s landmark: a some 7 metres high pyramid made from red sandstone. The extraordinary buuilding covers the tomb of the city founder Charles William. At first, this place hosted the Concordia Church, but in the year 1806 the sovereign family decided to turn Karlsruhe into the representative capital of the Grand Duchy Baden and redesigned the Market Square. Inspration for the new monument came from the spirit of that time. Since Napoleon’s military campaigns to Egypt in the year 1798 the Egyptian style influenced Europe. The pyramid was quickly liked by Karlsruhe’s citizens, and today it is part of the official lettering of the city. The vicinity to France can be seen everywhere in Karlsruhe. Pleasure and culinary delight are written in capital letters. Baden’s kitchen is well known and specialities like pork filet in wine sauce, trout in Black Forest style and, of course, white asparagus as the royal vegetable do not have to fear the competition of French delicacies. 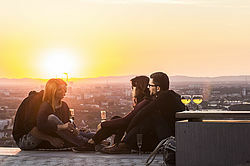 Many restaurants in Karlsruhe concentrate on high-class Baden style kitchen like the “Anders auf dem Turmberg” on Karlsruhe’s city mountain Turmberg, “Alte Schmiede” in the historic district Durlach, “Künstlerkneipe” which also offers matinées and concerts, or “Oberländer Weinstube” which serves a wide variety of Baden’s wines from the Karlsruhe region. Also apart from you are spoilt for choice when going out in Karlsruhe. The city offers everything what night owls desire. Traditional brewhouses like “Vogelbräu”, “Wolfbräu”, “Hoepfner-Burg” oder “Baden Brewhouse” offer home-style cooking whereas the scene cafés around Ludwigsplatz convey urban flair. Karlsruhe is truly an outdoor city, with the first rays of the sun it draws its guests and visitors outside and there are beer gardens at every corner. Karlsruhe is seen as trend-setting for public transportation: In September 1992 for the first time in the modern era of public transport tram-train cars abolished the separation of tram and railway. The so-called “Karlsruhe model“ served as example for numerous cities in many countries. In Karlsruhe, you can enter a tram and go directly to the Black Forest or to Heidelberg and Baden-Baden. The State Art Hall Karlsruhe is one of the oldest and most outstanding museums in Germany. It was opened in the year 1846 and is one of only a few early art museums big parts of which still consist of their original substance and fittings. Three historic buildings are located next to the Botanical Garden. The emphasis of its collection going over seven centuries lies on German, French, and Dutch painting. Visitors can not only see over 800 exhibits, but also an etching cabinet with more than 90,000 sheets and one of the largest museum libraries open to the public. State Art Hall Karlsruhe sees itself as a mediator between past, present, and future, therefore the Young Art Hall is presenting alternating exhibtions especially for children and young people. Exciting exhibtions and a wide variety of events – in the Museum of Natural Sciences nature becomes an adventure for the whole family. There are unique exhibits like a pterosaur model with 12 metres of wingspread, an earthquake simulator, minerals, fossiles and true-to-life dioramas as well as living animals like insects, reptiles, fish and more. On an area of 800 square metres in the reconstructed western wing of the museum a unique exhibition “form and function – archetype nature” with spectacular big objects is presented, for example a 240,000 litre sea water aquarium with reef sharks where the biggest living coral reef in Germany is growing. Basing on biologic examples the exhibtion shows ideas and products wich follow design and construction principles from nature, from gecko tape to lotus principle coating and offshore wind generators. Karlsruhe unites urban flair and a pleasant natural landscape. Only a few minutes away from the city centre with its vibrant shoppig streets the green oases invite you to take a walk or have a rest. The city park with the zoological garden is one of the biggest inner city parks in Germany. A popular destination for excursions is also the palace garden. The park was set up 1731-1846 in French baroque style and changed towards an English style landscape garden over the years. From April to All Saints’ Day the palace garden the palace garden railway is in service ob a 2.5 km circuit. Over 70.000 km of hiking trails are available in and around Karlsruhe, and there is also an extensive network of bicycle paths in a varying landscape. Water sportsmen can find one of the largest inner harbours of Germany, the Rhine harbour, with a 3 km trainingroute for free time and competitive athletes. There are plenty of shopping facilities in Karlsruhe, for example in one of the largest indoor shopping centres in Southern Germany, the Ettlinger Tor Karlsruhe, or along Baden’s longest shopping street Kaiserstraße. Shoppers who are looking for extraordinary things can strike in the side streets: In Südliche Waldstraße exclusive boutiques, antiques shops, living design studios and galleries are located on a length of 214 metres. High-class fashion and design can also be found along Erbprinzenstraße and Karlstraße. At the end of 2006 the Karlsruhe slaughterhouse, founded 1887, ceased operation. The area was renamed to „Creative Park Old Slaughterhouse“ and is meant to offer new perspectives for creative economy in Karlsruhe with its broad cultural choice. Many persons engaged in the media and cultural sectors have their places of business here. A new, lively town quarter with cultural institutions and gastronomy is arising. Research-oriented, innovative enterprises as well as creative companies find their place next to each other. Close to the city centre and the university new, future-oriented, creative places of work are introduced. Actors from different branches of creative economy can work together in an innovation-friendly, communicative, and inspiring environment.